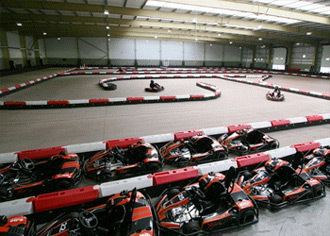 Like is sister track near Falkirk this also is one of the best indoor kart circuits we have seen. It also has a 5-star rating from the local press and has super facilities for drivers and spectators and can provide excellent conference and catering for large groups. From Junction 1 of the M9 take the B7030 eastbound and turn left at Huly Hill Road; the circuit is on the right. An adult-only race event: practice followed by two race heats and a grand final. Practice plus five qualifying heats and a grand final for top points-scoring drivers.